The Japanese mcchip-dkr sales partner Kohei Fukuda also took part in the 7th round of the long-distance championship, last weekend. 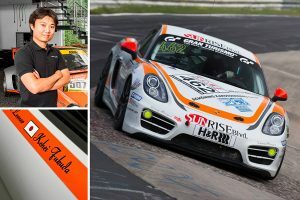 Fukuda took a seat behind the wheel of a Porsche Cayman 981 in class V5 from PROsport Performance with Dominik Schöning, from Wülfrath. Unluckily, his race was ended quickly. Already in round 3 happens the indebted collision with another Porsche Cayman, In the section “Wehrseifen”. For the involved drivers, the situation went smoothly. Unfortunately, however, both cars left the race. Fukuda will significantly expand its motorsport projekct, for the 2018 season. Kohei Fukuda will compete with his own Porsche 981 Cayman in the V5 class in the VLN and the ADAC Zurich 24h race. The preparations for the project will start this winter. Our mccip-dkr motorsport department, headed by Florian Störmer, will be supporting this in 2018.